As I’ve noted before, Detroit is all too frequently just a blank screen onto which people project their own personal bogeymen. So liberals see in Detroit racism gone wild, America’s comeuppance for its love affair with the automobile, and corporate greed. Conservatives see the ultimate end result of unions and where liberalism will take the US as a whole if it isn’t stopped. There’s a bit of truth in all of these. The left would have us believe that having Democrats in charge of the city for so long had nothing to do with where it is today. But they reality is, they’ve got to own their piece of blame. Detroit certainly hasn’t been a bastion of conservative policy, that’s for sure. On the other hand, Republicans should be aware that Detroit’s decline has been ongoing for quite a while, and there were definitely some mayors with R’s by their name who were in on the game. And economic forces shaped Detroit far more than they’d like to admit. But ultimately what we see today is the left furiously spinning about Detroit (for example, see the book “Detroit: A Biography”) and the right trying to use it as a poster child for everything they hate. Yet on the right I can’t help but observe a particularly mean streak in the commentary, one that’s positively gleeful about Detroit’s demise. It’s as if, not content with letting the results speak for themselves about what happened under Democratic rule, the right seems determined to humiliate Detroit, reveling in its pain. It’s schadenfreude on steroids. The agonizing death of Detroit is cause for celebration. It’s the first of the liberal-run big cities and states to fall, and we should welcome its collapse with glee. Yeah, liberals, eventually you do run out of other people’s money. The blue state model is a terminal disease, and Detroit is its poster child. Only this is one telethon where we should pledge that we won’t pay a single dime to keep the progressive party going a single minute longer. Detroit represents the epitome of the blue state, Democrat machine liberalism that Barack Obama represents. Well, not one damn cent for Barry’s Kids. What no one wants to do, apparently, is sell the city’s assets. The city has largely unused parks and waterfront property that could be opened to economic development. The Detroit Historical Museum has a collection of 62 vehicles, including an 1870 Phaeton carriage and John Dodge’s 1919 coupe, that is worth millions. But the biggest sacred cow is the Detroit Institute of Art (DIA), one of the nation’s oldest and most valuable art museums. It has pieces by Vincent van Gogh, Henri Matisse, Andy Warhol, and Rembrandt. The Institute also owns William Randolph Hearst’s armor collection and the original puppet from the children’s TV show Howdy Doody. The Detroit Free Press asked New York and Michigan art dealers to evaluate just a few of the 60,000 items in the Institute’s collection. The experts said the 38 pieces they looked over would fetch a minimum of $2.5 billion on the market, with each of several pieces worth $100 million or more. That would go a long way toward relieving the city’s long-term debt burden of $17 billion. Let me get this straight. Instead of Detroit being $17 billion in debt, let’s sell off everything left that makes Detroit viable and end up still $14.5 billion in debt and still bankrupt. (Though only a few items were evaluated, they were clearly the handful of most valuable ones. Howdy Doody ain’t Van Gogh). Oh, yeah, that will help – if your definition of help is bailing out banks who loaned money to a city everyone has known is a basket case for many, many years. If those banks expected the art to be sold, they should have made the city pledge it as collateral. 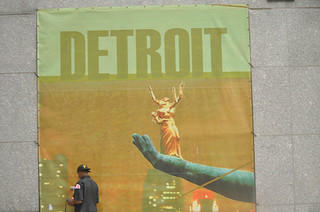 Fund is right that Detroit does need to make tough choices about assets. I’ve made that argument myself. But the goal should be to create at a minimum a sustainably functional government and ensure the bankruptcy of the city of Detroit doesn’t undermine the broader region and state. Selling off secondary assets (and yes, Howdy Doody may be a good candidate) is worth pursuing if there’s cost/benefit. But saying that Detroit should sell off its regional cultural crown jewels is little more than an attempt to inflict counter-productive penance, to force humiliation upon the city. And it would also be completely unlike say a corporate Chapter 11 restructuring, which is designed to produce a viable firm on the other end and thus the most valuable assets are often retained. Does this mean that retired city workers should take the same haircut as municipal bond holders? I really don’t think so. Anyone loaning money to the city of Detroit was knowingly taking the risk that the city might not repay; that’s why bonds issued by Detroit paid a higher yield than Treasury securities, which are assumed to be riskless. As with any risk investment, sometimes it pays off, sometimes it doesn’t. City employees, on the other hand, exchanged services today — along with employee contributions to their pension plan — for benefits to be delivered in the future. Sure, employees should consider the financial stability of their employer in its ability to deliver what is promised, but city employees seem to be a qualitatively different group than municipal bond holders. This seems more rational type analysis and isn’t rooted in mean-spiritedness. Though eager to point out how Democratic policies and corrupt Democratic politicians helped propel Detroit headlong in bankruptcy (which is certainly a valid political claim to make), having a vengeful streak only shows Republicans behaving in a ways that’s as hard hearted as Democrats say they are. Submitted by marcbarber467 on Thu, 06/04/2015 - 13:04. Submitted by Calbill on Mon, 05/25/2015 - 17:57. Submitted by xijozx1122 on Mon, 05/11/2015 - 02:19. Submitted by xijozx1122 on Thu, 05/07/2015 - 04:48. Submitted by jeparaonline on Fri, 05/15/2015 - 13:01. Submitted by xijozx1122 on Sun, 05/03/2015 - 03:27. Submitted by siya23 on Wed, 05/27/2015 - 01:16. Submitted by siya23 on Wed, 05/06/2015 - 02:59. Submitted by siya23 on Wed, 05/06/2015 - 02:57.